It’s iced tea season; brew a batch. Photo courtesy TeaForte.com. As the weather grows warmer, our thoughts turn to iced tea. Even though fine brewed tea continues to grow in popularity—and tea is the second most-consumed beverage in the world, after water—about 80% of the tea sold in the U.S. is bottled tea, generally consumed cold. That’s an expensive way to consume tea, not to mention millions of bottles going into the landfill. Save money and save the planet by brewing your own iced tea. 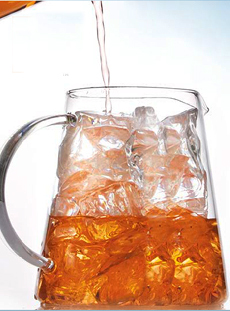 Keep a pitcher of iced tea in the fridge as a calorie-free beverage. In fact, keep two pitchers with two different types of tea—Earl Grey and Assam teas, peach tea and passionfruit tea, or any black and green teas. You need to make iced tea stronger than regular tea to compensate for dilution from ice. Even if you don’t use ice, the coldness of refrigerated tea can suppress some flavor components; so stronger is better. Another tip: The better the tea quality, the more enjoyable the tea. Some mass supermarket brands don’t have the best flavor (our favorite brand is Bigelow), and many people add MORE sugar to make the drink taste better. Try making iced tea from the best tea, and see if you can enjoy it without sweetener. Eliminating sweetener allows you to taste the complexity of fine tea. 1. PLACE the tea into a pitcher or clean quart bottle for brewing. If using loose tea, enclose it in a tea ball/spice ball for easy clean-up. 2. BOIL 2 cups of cold water (tap water or filtered). Pour the boiling water into the pitcher and steep for 5 minutes. Remove the tea bags or strain the loose tea into another pitcher or receptacle. Add 2 more cups of cold water and refrigerate. 3. SERVE over ice with optional garnishes. We make our ice cubes from brewed tea so the tea never dilutes. Just pour room-temperature or chilled tea into an ice cube tray. *We brew two quarts at a time in a 64-ounce pitcher. Superfine sugar dissolves more easily in cold liquids than regular table sugar. You can purchase superfine sugar, or pulverize your table sugar in a spice grinder. Think beyond the sugar and try agave nectar (also called agave syrup). It has a more elegant sweetness than sugar (which can be cloying), and mixes easily into cold beverages. While agave nectar contains virtually the same amount of calories as other liquid sweeteners like honey and maple syrup, it is far, far lower on the glycemic index. Try giving up sweetener by adding fresh lime or lemon juice. Plan for an iced tea party—a great way to socialize indoors or outdoors. While drinking tea dates back thousands of years, ice to keep foods cold was available only to the wealthy few, who could afford ice houses. During the winter, the ice house, built in a shaded area, sometimes below ground, would be loaded up with ice and snow and packed with insulation such as straw or sawdust. The original purpose was to store perishable foods in the warm months, but the ice could also be used to cool drinks or make ice cream and sorbet. 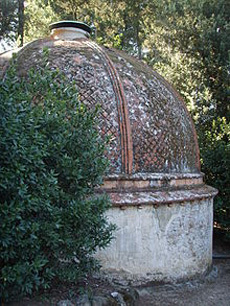 The domed ice house in of the Pitti Palace in Florence, Italy, the main seat of the Medici grand dukes of Tuscany. It is set on a shaded slope in the Boboli Gardens behind the palace, half-sunk into the ground. During its heyday, commercial ice houses would store tons of ice for purchase. Still, ice houses only existed where there was a source of natural ice. In 1806, Frederic Tudor, a New England entrepreneur, came up with the idea to export ice on a commercial basis. Barges of ice covered in sawdust were shipped in ancient times to hot places like the Middle East, but only on a minuscule scale, for kings and other people of great wealth. Tudor’s first shipment was to the Caribbean, and the “Ice King” ultimately shipped ice all over the world. Tudor invented an entire industry, the ice trade. Now to the invention of iced tea. The drink didn’t appear on the scene until 1904, at the St. Louis World’s Fair. An Englishman named Richard Blechynden was trying to sell tea as a refreshment, but the weather was very hot and no one was buying. As necessity is the mother of invention, he added ice to the tea, and the new refreshing drink was born.